On Thursday, heavyweight Ben Rothwell (pictured) announced he has been issued a nine-month suspension for elevated levels of testosterone. Here’s the interesting part of Rothwell’s predicament, he wasn’t banned by the Wisconsin Department of Safety and Professional Services, the commission who oversaw his TKO victory over Brandon Vera at UFC 164. The 31-year-old was suspended by the UFC. Although Rothwell requested and was granted a therapeutic-use exemption for testosterone replacement therapy (TRT) for August’s bout with Vera, and he claims to have remained under the permitted testosterone levels throughout training camp, he ultimately flunked his post-fight drug test. Rothwell, a 13-year veteran, has alternated between wins and losses over his past nine outings. Coincidentally (or maybe not), his performance against Vera was the most impressive he’s looked in quite some time – if not ever. No word if Vera will look to appeal the loss and have the match overturned to a no contest. It would mark the second time (UFC 125 against Thiago Silva) Vera had a defeat reversed after his opponent tested positive for a banned substance. UFC 164 took place August 31 inside Bradley Center in Milwaukee. As the result of a blood test indicating an elevated level of testosterone in his system following UFC 164 in Milwaukee, Wisc., on Aug. 31, the UFC has suspended heavyweight Ben Rothwell for nine months from the date of the contest. 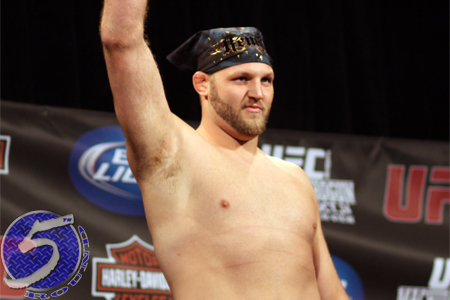 Rothwell’s post-fight blood test was administered by the Wisconsin Department of Safety and Professional Services. While the Wisconsin Department of Safety and Professional Services has elected not to impose any discipline on Rothwell, to date, the UFC holds its athletes to a high standard of personal and professional conduct and finds that Rothwell’s actions merit the suspension as a violation of the UFC Fighter Conduct Policy and his Promotional Agreement with Zuffa, LLC. Upon completion of his suspension, Rothwell must also submit a negative drug test before being allowed to compete in a UFC event.